We are all sadly aware of the humanitarian crisis sweeping through Europe at the moment. I've been thinking for the past week if there was something we can do with Fairy Bricks to help. A large concern about anything we could send would it be reaching the correct people. 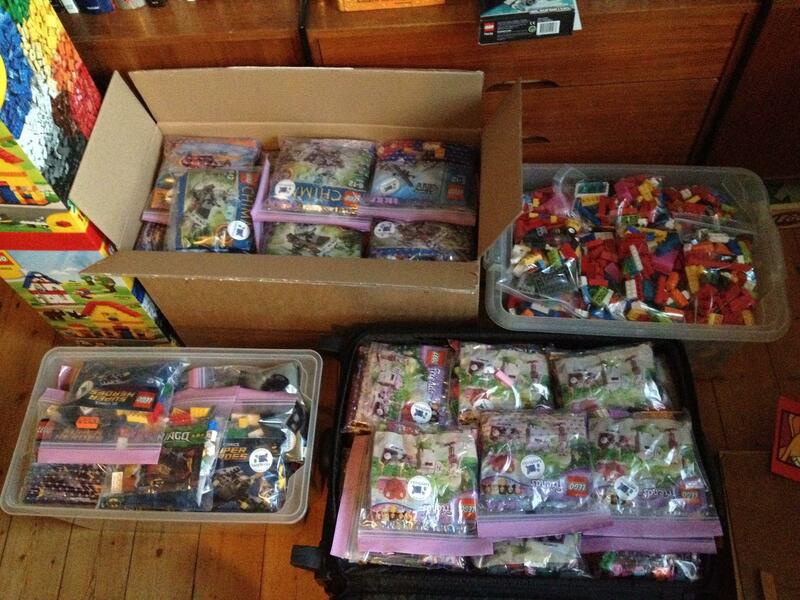 We wouldn't want a situation where 80% of anything we sent was to go "missing"
Thankfully one of the members of 1000steine.de a German LEGO User Group has agreed to hand deliver any polybags we can send from here so they end up being played with by children. These people have far more pressing concerns than LEGO, we all know that but surely the children having a wee polybag to play with can only help. I'm sure I've got a few spares I can send you. Excellent cause and like you say it won't solve the crisis but those poor kiddies deserve to still be children and have some toys to play with. I've got some spare ones I can send you as well @sirkevbags. I'm sure I can dig through and find some duped too... is there a deadline for this? I'll try to get to it this weekend to send out on Monday. ..
@khmellymel No deadline, there could be a constant flow for a little while. Do you know where the 1000steine.de user is? I'm heading to frankfurt on tuesday so in theory could drop off some of mine to them to save postage. Google maps says 170km north of Frankfurt so quite a distance. Being in the U.S. I would probably need the German address. I know I have extras and I bet if I asked around I could find others who do as well. I will be in Hamburg in October so could deliver some if the contact is near there. @MeganL He is a long way from Hamburg unfortunately but if you would like to mail anything direct then I can pm the address. Megan, in/near which California town do you live? Are you going to any big cities/events before your German trip, and what day do you leave on the trip? Maybe someone from Hamburg could deliver the ones MeganL takes over in October from the US. That way there would be little spent on postage. @SirKevbags if you could PM the address that would be great. I hadn't thought of mailing them when I was in Germany, though that's a great idea. @legogal I live in the Bay Area. Plans are in flux but I'll be leaving either October 6 or 13. Actually if I leave on the earlier date I'll be in England first, and I can mail them to the Fairy Bricks address. Considering the refugees are likely going to be moved around a lot, might be good to give out a zipping sandwich bag along with the polybag so the parts don't get lost. Great idea.I'll be in the UK in a couple of weeks so will post them to you when I get there. I honestly wish that Polly Bags were easy to get here, I'd love to help. Unfortunately we only get them in specialist shops and they go for around $15 per bag. Beautiful idea. very compassionate! I don't have any spare polys but a few mixels spare, would they be suitable? a cute idea but how about people sign up to donate a month's Lego allowance instead? I'm sure with the amount spent on Lego just by Brickset members in 1 month, a quite substantial amount could be raised whilst still relating the charity to Lego. @nexander Mixels would be most welcomed. @Greendude as a Charity, Fairy Bricks never distributes cash, always LEGO. Our core work of hospital deliveries is based around £800rrp of sets per hospital. We aim to spend no more than £400 in achieving that. With the other things hospital staff have to do there is no way they could achieve such discounts if we gave them the cash. With this particular appeal we felt there was a need to move quickly and polys are an ideal small portable plaything. 500 are already on their way to Germany with hopefully more to follow later this week. In principle though I like your idea about a months allowance. I wonder how many members have a budget like that? A month with no buying could be an interesting discussion topic! @SirKevbags polys will be going in the post tomorrow. You have Dryathon, sober for September and movember, how about something similar for fairy bricks? Getting sponsored for abstaining from Lego for a month or something similar? My wife would sponsor me just so she can get more attention! @SirKevbags Dropped you an email the other day, did you get it ? I'm sure that I have some polys that I can send over. I'm in the US, so it would probably be more cost effective if I send it straight to Germany. It might take a couple of weeks for the package to get there, though. Would that be okay? Just posted 14 polybags to the address above Kev. Good work, as always. What kind of polybags? BR? Also, these are being delivered to refugees in hospitals? Over 600 polys have been dispatched to Germany. 100 or so have arrived and I added 400 from Fairy Bricks stock. In addition @caperberry threw in 100 and collected more from the London AFOL meet up. Thanks to everyone who has contributed. They have all arrived safely and are now being given out to children in refugee camps. When the pictures arrive I'll post them up. We have 280 poly bags ready to go from the Indiana in the U.S. Do you have the address in Germany? I just noticed this announcement/appeal has vanished from the forum recent discussions view. Was this an accidental consequence of some forum clean-up, or @SirKevbags ' request? (Obviously, this post has momentarily bumped it... but had the appeal ended is the key question). @legomatt Nothing has ended, this pretty much like anything that Fairy Bricks does is a constant ongoing process. Jorg is hard at work now hand delivering things but his stock will run dry and pretty quickly. Jorg is also pretty good at the packaging! Ikea in Germany gave him a load of bags so each poly has gone into one with a few extra bricks so they can be kept together when the poly has been opened. ^^Whoa how stressful was the exodus? That kid on the right is going full on grey! And much props and kudos to Fairy Bricks in helping to brighten the day for these refugee kids. Their appreciation and gratitude for this warm welcome will stay and grow with them over the coming years. Great job FB team! Recently I saw the story about Tempelhof Airport being used to house thousands of refugees, until they can be integrated into Germany. I though the kids looked very bored and wondered/hoped that this donation was happening and also wondered if it would be possible to extend the polybag thing to that site? Maybe buy some small creative boxes, as they are low priced in Amazon.de right now. Is there a German AFOL who could coordinate this? Jorg? I'll be heading to 'the jungle' refugee camp in Calais in a couple of weeks with my boss (no exact date yet, but she has a camper and goes about once a month donating clothes). I'm going to help her this time and wondered if I could help Fairy Bricks and the afol community too by delivering some polys to the kids? Just wondering in case it's not and I won't have to worry about diverting my polys. Is this still an active program? I am curious as well. Snagged some clearance polys at Target which could happily be donated to a camp, if needed.